A Latter-day Saint woman shares her thoughts on this question of good and evil. God did not create evil; everything He created was good. However, God believes in agency, considering it essential to our eternal salvation. Agency is the right to choose for ourselves. Some people choose to be evil and so evil was created through the choices of men, not by God. How we choose to use the great gift of agency tells God, the world, and ourselves what sort of people we are. Mormons believe that we were created as spirits before we came to earth. We lived in that form for a while, and even there we had agency. We had our own personalities and began the process of deciding who we wanted to be. When it was time for us to come to earth to live, God explained the program to us. Since justice required us to be perfect in order to return, and that, of course, wasn’t possible, He planned for us to have a Savior. Jesus Christ volunteered for this position. The atonement had to be a voluntary act. 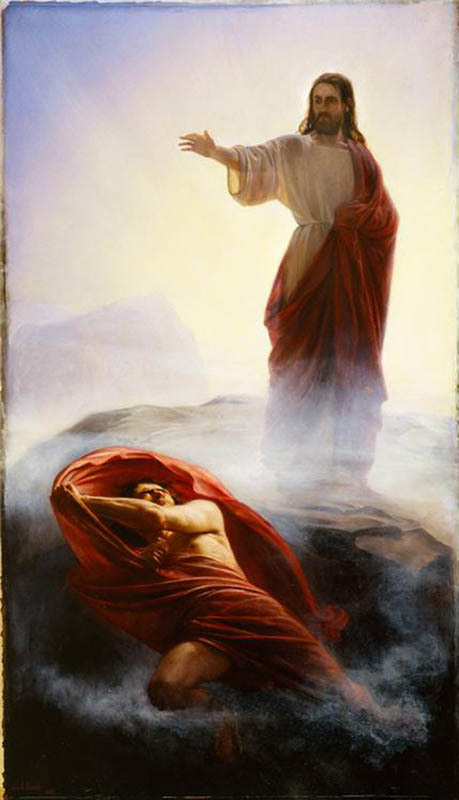 He was willing to live a sinless life, suffer extraordinary pain in the Garden of Gethsemane, and die on the cross for us, to be risen three days later. All this He would do out of pure love for us, and He wanted nothing in return. He asked that we give the honor and glory to God. Satan, however, hated that plan. He tried to overturn it and to convince us to refuse God’s plan for us. He suggested instead that we come to earth completely controlled by him, making no choices for ourselves. In that way, we would never sin—he would make all the choices for us. This, he assured us, would guarantee we could return to God, and do so in a way that let him suffer no pain. He was willing to work hard, but not to suffer for us, because love had nothing to do with his plan. He explained that in return, we had to promise to worship only him. This idea was all about him, not us and our eternal well-being. His way would have rendered life on earth meaningless and would have overthrown essential eternal truths and requirements. He would have tried to replace God. Did God create evil? No, He gave us agency and then we choose to create it ourselves with Satan as our cheerleader. When evil is in the world, mortals have only themselves to blame, since even Satan can’t make us do evil. We choose to do so. In the Church of Jesus Christ of Latter-day Saints (errantly called The Mormon Church by the media from time to time), we believe in a God who wants us to use our individual agency. The logical problem with associating my keys and big disasters, like the Holocaust, is that we put the choice back on God. By connecting the two ideas as parallel, we are pinning God’s desire for us to use individual agency against our perception of how we think He should use His agency, or free will. The fact of the matter is that God will help each individual, no matter the circumstances, to make correct choices within our sphere of influence. If someone is in wonderful, awful, or unlivable circumstances, they still have a range of choices, and God will help them make the right choice, but only if they want to and ask Him to help them. God did not create evil, nor does he use it as a teaching tool. However, if we want to use our agency, or free will, to learn from an negative experience, He will guide us in our choice to move forward. For my friend, this view of God that I presented to him may have made sense—or maybe not. However, I know that God is interested in my personal development enough that he will not prevent me from making good choices—or sometimes, bad choices. I can learn if I want to. I can find God if I want to. He will not interfere with my life with a miraculous display of power, but rather touch me softly after I’ve sought for His love. Thank you for this thoughtful response, Alex. So true. I think when we remove the divine law of agency–as you said well– and the beauty of God’s constancy in respecting that law so we can grow, we would come to the conclusion that He is missing or AWOL when He could have been there. Instead, the Father and His Son, Jesus Christ, are very much there, as the Savior was on the shores of Galilee during the storms, in the moment for Saul on the Road to Damascus, and eternally for each of us in the garden and on the cross. If we miss the need for agency–however raw the use or abuse of it is–we can then draw wrong conclusions and think God the Father or Jesus Christ, have betrayed our trust in Them or that They have abandoned us. This is far from true and if we remember Gethsemane, we are reminded that the notion that God doesn’t care or has turned away is not true. His Son, the Savior, suffered for our every hurt personally, so that distorted view of God absent in suffering or disregarding it, can not hold water. He does work the agonies of life into glories over time (as mentioned by CS Lewis & in the Holy Bible: Book of Revelation)–not that the misery and consequences of others’ choices won’t be felt and dealt with by him, but that our suffering for others’ wrong choices as well as for own foibles, will work to ends that are ultimately positive, and only love’s pure joys will remain eternally (as the hymn records).